The paper presents simulations of the operation of a novel two-stroke engine for road Super Sport motorcycles. Two-stroke engines were preferred to four-stroke engines in Grand Prix motorcycle racing until the start of the Moto GP era when new rules phased out the two-stroke engines. Reasons for the change were the poor fuel economy and significant pollutant emissions. The paper discusses the opportunity of a came back at least in road Super Sport motorcycles thanks to the recent advantages in direct injection and precise lubrication for two-stroke engines, plus the opportunity to use jet ignition, based on performance simulations. “NSR500,” http://world.honda.com/MotoGP/history/NSR500/, retrieved Oct. 27, 2016.
ta.html, retrieved Oct. 27, 2016. “Bimota 500 V2 evoluzione,” http://www.motorcyclespecs.co.za/model/bimota/bimota_500%20v%20due%20evoluzione.htm, retrieved Oct. 27, 2016. “Aprilia RS 250,” http://www.motorcyclespecs.co.za/model/aprilia/aprilia_rs250%2000.htm, retrieved Oct. 27, 2016. “Aprilia RS 125 R,” http://www.motorcyclespecs.co.za/model/aprilia/aprilia_rs125r_10%20biagie%20rep.htm, retrieved Oct. 27, 2016. “2-Stroke engines,” http://www.brp.com/en-us/innovation/eco-performance-technologies/2-stroke-engines, retrieved Oct. 27, 2016. “Rotax 600 H.O. E-TEC engine for ski-doo snowmobiles,” http://www.brp.com/sites/default/files/Resources/en-CA/Media. Center/PDF/2007_01_31_E-TEC_backgrounder.pdf, retrieved Oct. 27, 2016. “Direct injection keeps two-stroke alive for Bombardier in 2012,” http://articles.sae.org/8157/, retrieved Oct. 27, 2016. F.Winkler,R.Oswald, O.Schoegl, and N.Foxhall, “Characterization of different injection technologies for high performance two-stroke engines,” SAE Technical Paper 2016-32-0001, 2016. A.S.Krishna, J. M. Mallikarjuna, and D. Kumar, “Effect of engine parameters on in-cylinder flows in a two-stroke gasoline direct injection engine,” Applied Energy, vol. 176, pp.282-294, 2016. 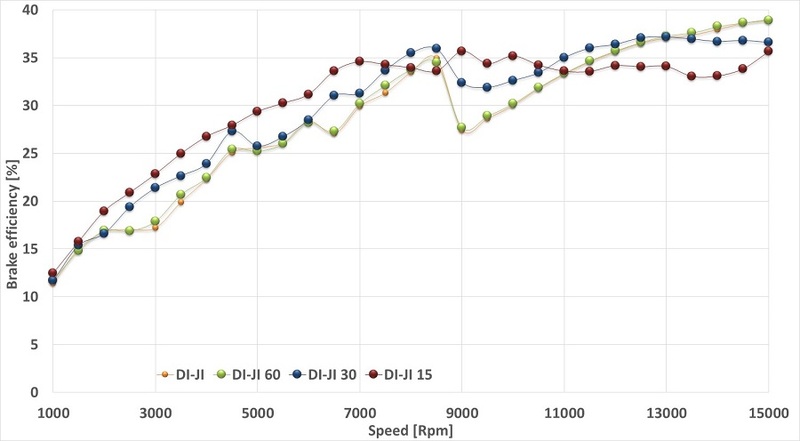 A. Dube and A. Ramesh, “Influence of injection parameters on the performance and emissions of a direct injection two stroke SI engine,” SAE Technical Paper 2016-01-1052, 2016. R. Liu, M. Wei, and H. Yang, “Cold start control strategy for a two-stroke spark ignition diesel-fuelled engine with air-assisted direct injection,” Applied Thermal Engineering, vol. 108, pp. 414-426, 2016. M. Dalla Nora, T. D. M. Lanzanova, and H. Zhao, “Effects of valve timing, valve lift and exhaust backpressure on performance and gas exchanging of a two-stroke GDI engine with overhead valves,” Energy Conversion and Management, vol. 123, pp. 71-83. 2016. F.Winkler,R.Oswald,O.Schögl, A.Abis, S.Krimplstatter, and R. Kirchberger, “Layout and development of a 300 cm 3 high performance 2S-LPDI engine,” SAE Technical Paper 2015-32-0832, 2015. F.Balduzzi,G.Vichi, L.Romani, G.Ferrara, P.Trassi, J.Fiaschi, and F. Tozzi, “Development of a low pressure direct injection system for a small 2S engine. Part I-CFD analysis of the injection process,” SAE International Journal of Engines, vol. 8, pp. 1885-1897, 2015. L.Romani,G.Vichi, G.Ferrara, F.Balduzzi, P.Trassi, J.Fiaschi, and F. Tozzi, “Development of a low pressure direct injection system for a small 2S engine. Part II-experimental analysis of the engine performance and pollutant emissions,” SAE Technical Paper 2015-01-1730, 2015. A.Boretti and H.Watson, “The lean burn direct injection jet ignition gas engine,” InternationalJournal of Hydrogen Energy, vol. 34, no. 18, pp. 7835-41, 2009. A.Boretti and S. Jiang, “Development of a two stroke direct injection jet ignition compressed natural gas engine,” Journal of Power Technologies, vol. 94, no. 3, pp. 145-152, 2013. J. Fleck, R. Fleck, R. J. Kee, G. F. Chatfield and D. O. Mackey, “Validation of a computer simulation of a high performance two-stroke motorcycle racing engine,” SAE Technical Paper 2004-01-3561, 2004. Z. H. Kyaw and H. C. Watson, “Hydrogen assisted jet ignition for near elimination of NOx and cyclic variability in the SI Engine,” Symposium (International) on Combustion, vol. 24, no. 1, pp. 1449-1455, January 1992.
engine,” SAE Technical Paper 961104, 1996. G. Dober, “Geometric control of HC emissions,” Ph.D. dissertation, Dept. Mech. Eng., The University of Melbourne, Melbourne, VIC, Australia, 2002. Melbourne, Melbourne, VIC, Australia, 2006. P. Mehrani, “Predicting knock in a HAJI engine,” Ph.D. dissertation, Dept. Mech. Eng., The University of Melbourne, Melbourne, VIC, Australia, 2008. E. Toulson, “Applying alternative fuels in place of hydrogen to the jet ignition process,” Ph.D. dissertation, Dept. Mech. Eng., The University of Melbourne, Melbourne, VIC, Australia, 2008. A. Boretti and H. C. Watson, “Numerical study of a turbocharged, jet ignited, cryogenic, port injected, hydrogen engine,” SAE Technical Paper 2009-01-1425, 2009.
engine,” International Journal of Hydrogen Energy, vol. 34, no. 5, pp. 2511-2516, 2009. A. Boretti and H. C. Watson, “The lean burn direct-injection jet-ignition gas engine,” International Journal of Hydrogen Energy, vol. 34, no. 18, pp. 7835-7841, 2009. A. Boretti, H. C. Watson and A. Tempia, “Computational analysis of the lean burn direct-injection jet-ignition hydrogen engine,” Proc.Institution of Mechanical Engineers, Part D: Journal of Automobile Engineering, vol. 224, no. 2, pp. 261-269, 2009. A. Boretti, R. Paudel and A. Tempia, “Experimental and computational analysis of the combustion evolution in direct injection spark controlled jet ignition engines fuelled with gaseous fuels," Proc.Institution of Mechanical Engineers, Part D: Journal of Automobile Engineering, vol. 224, no. 9, pp. 1241-1261. E.Toulson, H.Schock, and W.Attard, “A review of pre-chamber initiated jet ignition combustion systems,” SAE Technical Paper 2010-01-2263, 2010. W. Attard, N. Fraser, P. Parsons, and E. Toulson, “A turbulent jet ignition pre-chamber combustion system for large fuel economy improvements in a modern vehicle powertrain,” SAE International Journal of Engines, vol. 3 no.2, pp. 20-37, 2010.
International Journal of Engines, vol. 5, no. 2, pp. 315-329, 2012. “WAVE,” www.ricardo.com/en-GB/What-we- do/Software/Products/WAVE/, visited August 12, 2016.